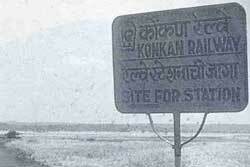 The controversy over the Konkan railway route through Goa is acquiring communal hues. The Diocesan Pastoral Council, which has adamantly opposed the coastal route contending it would cause dislocation, served notice last month on the state's Roman Catholic legislators to oppose the proposed railway actively or face the wrath of the church. Goa bishop Raul Gonsalves, who heads the pastoral council, had a well-publicised meeting with Prime Minister P V Narasimha Rao when Rao visited Goa recently and handed him a memorandum demanding a change in the rail route. Subsequently, the council announced it would use force if needed to stop construction work on the existing route. The council's actions have enraged the Maharashtra Gomantak Party (MGP), which has a substantial base among Goa's Hindu population. MGP demands the council must stop interfering with "development". In Bombay, meanwhile, the Shiv Sena has threatened to stop Goa-bound buses if railroad construction is halted. And, trying to cool tempers on both sides are Goan environmentalist groups, such as the Jagroti Geunchu Fauz.